We hope your playmate will be back soon Daiquiri. Daiquiri, you are turning into such a pretty cat. That toy is one of our favorites. Great picture. Have a super day. Such a pretty face, Daiquiri! Daiq, that's a really cool track. We love that it has a globe in the middle. Fun! Did that come like that or is it a self assembled double toy?? You look adorable leaning on it of course! 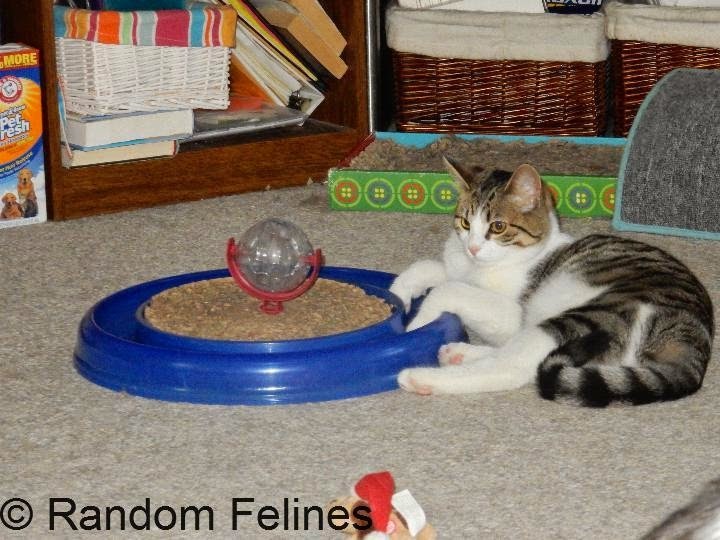 mom won it at BlogPaws in 2013....the thing in the middle is supposed to hold treats (but keeps flipping over) and there is no ball in the track (though mom will put one in there - it just won't stay). You look VERY serious, Daiquiri! Daiquiri, that's a pretty cool turbo track! Can you, like, see the future with that ball in the middle??? I like the disco ball in the middle of that turbo track! We used to have one of those! Cute picture. Are you waiting for someone to come play with you, Daiquiri?